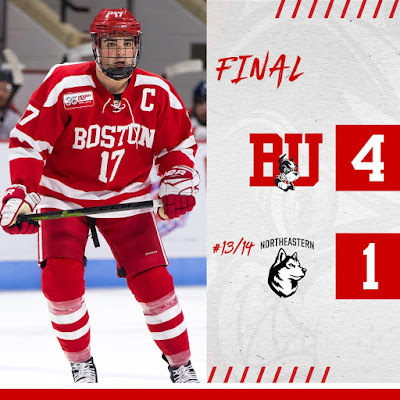 Paced by two goals from junior co-captain Dante Fabbro and a 37-save performance by Jake Oettinger, the Terriers completed their home-and-home series against Northeastern with a 4-1 win, taking three out of four conference points. BU also received goals from senior co-captain Bobo Carpenter and junior Patrick Curry and three assists from junior Chad Krys. The victory was BU’s first in the regular season and in Hockey East for new head coach Albie O’Connell. BU took a 1-0 lead (for the first time this season) when Curry passed to a streaking Fabbro who got behind the NU defense, beating Cayden Primeau from the slot just five seconds after a Terrier power play expired. Krys had initiated the play. The middle period was scoreless, but BU finally gained some breathing room just a minute into the third period on its fourth power play opportunity. Following passes from freshman Joel Farabee and Krys, Fabbro's slapper from just inside the blue line beat Primeau low to the glove side. A five-minute major and game misconduct to Cam Crotty for hitting from behind gave the Huskies a chance to cut into the 2-0 lead, but Oettinger slammed the door on four Northeastern chances. Midway through the period, Carpenter stole a pass, raced from the BU end and scored unassisted, rifling a shot from the right circle past Primeau for his fourth tally of the season and the milestone 50th of his BU career. Curry extended the lead to 4-0 with a shorthanded goal at 17:18, completing a two-on-one with Logan Cockerill with Krys adding his third helper. The Huskies finally got on the board with a power-play score with less than two minutes left. Oettinger, who had struggled in the losses to Merrimack and Providence, was particularly effective in the game’s opening period when he stopped all 13 NU shots and in the third when he turned away 15 of 16. Good choice for the hard hat, Dante. ► Freshman Jack DeBoer, son of San Jose Sharks head coach Peter DeBoer, is profiled by The Trentonian. 2019 recruit Robert Mastrosimone scored his eighth goal and added an assist in Chicago’s 5-2 loss to Muskegon. The winger from East Islip, NY has found the net four times in his past three games and leads the Steel in scoring with 13 points. Prospect Pipeline’s November rankings for next June’s draft features 2019 recruit Trevor Zegras as a player on the rise, moving up 10 spots to #13. He’s tied for the NTDP U18 scoring lead with 20 points. 2020 recruit Luke Tuch is featured in a USA Hockey report. The power forward from NY is tied for second in scoring on the NTDP U17s with nine points (5G,4A). The U17s begin play in the World U17 Challenge today, facing off against The Czech Republic. 2022 recruit Devin Kaplan scored a pair of goals and added an assist in the North Jersey Avalanche U16’s 5-2 win against Boston Advantage U16. 2021 recruit Jeremy Wilmer assisted on both Kaplan goals. After nine games, Wilmer (25 points) and Kaplan (20) are the Avs’ scoring leaders. Alex Chiasson continues to wield a hot stick, firing his sixth goal in eight games as the Oilers edged Detroit, 4-3. Jordan Greenway assisted on a pair of goals in the Wild’s 4-1 win against St. Louis. It was the first multi-point game of Greenway's brief NHL career. Charlie Coyle also had an assist for Minnesota. Jack Eichel assisted on three goals as the Sabres blitzed Ottawa, 9-2. Eichel leads the Sabres with 17 points in 14 games. Victoria Bach who set BU single-season records for goals (39) and points (67) last year, while earning first-team All-American honors, has been added to Team Canada’s roster for the upcoming Four Nations Cup in Saskatoon. Previously, former Terrier standout and two-time Olympic gold medal winner Marie-Philip Poulin was named Team Canada’s captain for the tournament.